The players truly range from newbies to advanced players. Our best players are not yet in the league of the Toronto best players but we mix well during pick-up games. Due to the popularity of the Hydro Cut mountain bike trail, there is a pretty even split of road bikes and mountain bikes being used by the club members. Almost all members have wheel covers to avoid spoke damage from fast moving mallets and balls. 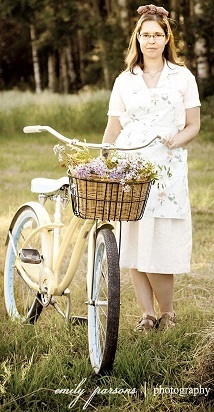 Single speed bikes are very common due to simplicity. Bikes are always a work in process. One of the more dedicated poloist of the group. Web guru, web promoter, court cleaner / maker are a few of his contributions. He first played polo with KW polo club in the spring of 2010. John has been to approximately 10 polo tournaments outside of KW including Montreal, Rochester and Toronto. His bike is a road bike with 700c x 48h wheels. He has a dual brake setup using a mini V-brake in front and dual pivot caliper in the rear. AKA The Bike Angel (no bike thief goes un-challenged, when the angel is around)! Shawn has been cycling for as long as he can remember. Former Toronto bike messenger, and CAN-BIKE representative, he is a spokesperson for cycling. The bike angel is also known for his traveling tool van. He is surprisingly graceful on the court and always a team player. Jenn bikes everywhere, whether she should or not. Rain, snow, ice, humidity: no problem! Going to work or out for an evening in crinoline and heels? Of course she is biking there! 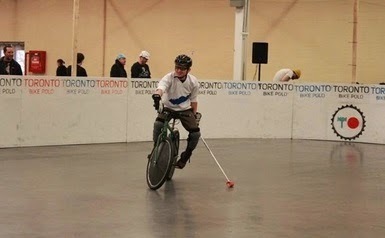 So playing bike polo seems like a perfect fit. She is still getting the hang of handling the mallet, but is becoming more confident every week. The coffee mon. Cause every little thing gonna be alright. Has a sixth sense for being in the wrong place at the right time. Matt is known in the club for his redeeming qualities such as his gentlemanlyness, ‎sense of fair play, and spirit of inclusiveness. Due to his past success at local tournaments he goes by the nickname "Champion." Of his own initiative he studied and educated himself on the official rules of bike Polo and is a certified NAHPB referee. Mike has one one setting. FULL ON. John is no longer a 'newbie'. Non the less, has enjoyed every minute of his time with the club. He has become the resident 'bike builder' and provides the club with much needed loaner bikes. He can often be seen riding circles around vets on his 20 inch clown bike. He is a world record holder for stilt walking.